Don't spend too much time fixated on refining margins and other things that are mostly out of Western Refining's control. Focus on this instead. Sometimes you don't need to be the biggest to be the best in an industry, and Western Refining (NYSE:WNR) makes for a pretty convincing example. Even though the company is nowhere near the largest refiner, you could definitely argue it's been one of the best in recent years at generating returns. While there are several reasons why the company has been able to do this, there is one factor that stands out more than the rest: keeping costs low. Let's take a look at why operational costs is the most important number that investors should watch when it comes to Western Refining, and how it has been a major part of the company's success in recent years. Refining companies are at their core price-taking companies rather than price makers. There are too many players in the industry in a relatively commoditized business for any one to have any real pricing power over refined petroleum products. With this in mind, it's not that effective to look at metrics like refining margins as a determinant of a company's ability to generate profits. Sure, a refiner's profits are to a great degree dependent on refining margins in any given quarter, but they are largely out of the refiner's control. What is really important for investors to keep track of in this industry is per-barrel operational costs. This, more than anything else, is the determinant of management's ability to run the business efficiently. The better job it does at keeping operational costs low, the better chance it has at turning a profit no matter the refining margins at the time. And based on the past several quarterly earnings, Western Refining has done a relatively decent job of keeping its costs in line. Data source: Western Refining earnings reports. Chart by author. Over the next couple of quarters, keeping tabs on these costs will be particularly important since we will now get to see how these costs stack up now that the company has completed the acquisition of the remaining shares of Northern Tier Energy. Northern Tier's refinery, which produces 90,500 barrels per day, now represents about 37% of total refining capacity for Western Refinng. Fortunately, Northern Tier's operations have been some of the better in the business. Last quarter, Northern Tier's per-barrel operational costs were $4.85 -- not a whole lot different than Western Refining's. Having lower per-barrel operational costs has been very beneficial for the Western Refining. It is a large reason why the company's three facilities generate some of the highest gross profits per barrel of crude as well as some of the best returns on equity in the business. 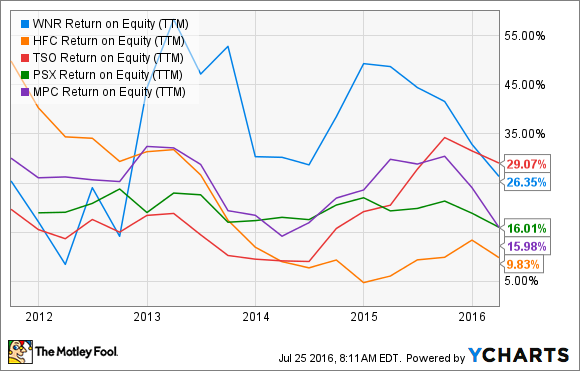 WNR Return on Equity (TTM) data by YCharts. Refining companies have really fallen out of favor lately as the short-term traders start to worry about refining margins declining. Yes, chances are, over the next several quarters we will see some less-than-awesome profit margins from refiners as crude oil prices modestly rise and refined product prices remain steady. But these numbers, in isolation, are only an indication of the broader market and not signs of the general health of a company in the industry. So as refiners start to report earnings, be sure to pay more attention to the company's per-barrel operational costs because that will be a much better indicator of the company's long-term profit-generating ability. This number is especially pertinent for Western Refining because it has been one of the better at keeping costs low and cranking out industry-leading returns. As the company looks to bring Northern Tier Energy into the fold, it will be even more important that it can show this acquisition will pay off as much as it appears it will on paper.